I had been craving for the Spicy Mutton Fried Rice served at The Enclave Restaurant & Bar for a while now but the thought of driving to parking-challenged Lorong Kurau in Bangsar was a definite dampener. Imagine my delight to find out that restaurateur Vignesh Nagenthram (“Just call me Vic”) had opened a branch in Damansara Kim, Petaling Jaya. Looking almost like a clone of the Bangsar restaurant, the interior has that familiar red brick walls and b/w pictures of old KL and people. Customers can sit at the bar, dining tables or tall tables at the al fresco smoking section in the front. Our little group start with a Somersby apple cider (RM20), cocktails including Enclave Sangria (RM25) and a mocktail, Royal Punch (RM20). There’s beer on tap as well as bottled Asahi, Corona, Hoegaarden White and Kronenbourg Blanc or choices of whiskey, vodka, rum and tequila. Then it’s appetisers. Cutlets (RM24/6pcs) come in choices of fish and lamb, well fried to a crispy golden brown. Tasty enough on its own to not require the chilli sauce provided. Korean Garlic Chicken (RM20), with onion and capsicum, is finger-lickin' good and makes a great companion for a jug of beer or two. The deboned chicken is cut in bite-size pieces and stirfried with a sauce that Vic created. It’s not all snacks and small bites at The Enclave. Serious eaters will find satisfying picks in the menu. Pasta, for instance, is a popular choice. Carbonara (RM20) is available with chicken cubes or crispy beef brisket and sautéed button mushrooms. A vegetarian version is also available. The spaghetti is coated in a creamy egg yolk sauce with plenty of grated parmesan on top. Perfect for young ones. For something more pedas, Enclave Lamb Pasta (RM24) is a good choice. The spaghetti is tossed with diced lamb cooked in special sauce and served with parmesan or chilli flakes. Mutton is an Enclave signature. Its Mutton Varuval (RM24) is a spicy South Indian dish bursting with aromas of cumin and fennel seeds. The dry curry dish, made with a recipe from Vic’s mum, is served with salad and vegetable crackers as well as rice or toast. It’s also the main ingredient in Spicy Mutton Fried Rice (RM24). This is my all-time favourite and so delicious I refuse to share it with anyone. Comes with lettuce and keropok. Lamb Sharwarma (RM24) is tortilla bread stuffed with hot sliced lamb and lettuce. Served with coleslaw, French fries as well as garlic dip and chilli sauce which you really don't need as the filling is so flavoursome. Then there are burgers and sandwiches. Classic Chicken Burger has a grilled chicken breast (RM22) in a bun with sliced cheddar, caramelised onion, pickled gherkin, lettuce. Served with French fries. Or you can opt for a beef patty (RM24). Portion’s enough to satisfy big eaters. The Enclave Club Sandwich (RM22) is triple layers of chicken ham, grilled chicken fillet, egg, tomato and sliced cheese in toast, served with French fries and coleslaw. The Enclave also serves Grilled Chicken Chop (RM22), Fried Chicken & Chips (RM22), Grilled Lamb Chop (RM38) and a Mixed Grill Platter (RM40) with chicken chop, lamb loin and chicken sausage with mashed potato and sautéed vegetables. The Enclave@Damansara will host the Abu & Raju Comedy Night on April 5-6, 2018, at 8.30pm. 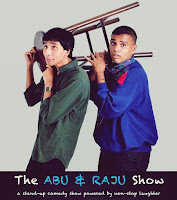 Come watch Farid Azmeir and Harresh AU dish up an hour of rib-tickling humour. Tickets at https://anr5atenclave.peatix.com/ (RM31) or at the door (RM41), inclusive of 1 Free Beer.